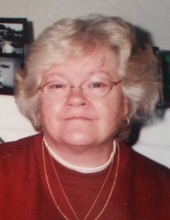 Beverly “Bev” Jean Newton-Pease, age 69, of Plattsmouth, passed away Friday, April 12, 2019 at University of Nebraska Medical Center. Bev is survived by her husband Art, sons Ed Pease, Scott Pease, Chris (Krista) Pease, brothers Larry Bucker, sisters Yvonne (Ralph) Pease, Mary (Tom) Matthews, grandchildren Kelsey, Megan, Emily, Lauren, Bradley, Victoria, Vanessa, Christopher as well as many nieces, nephew’s family and friends. She is preceded in death by her parents, granddaughter Jessica, sister Judy Richards and uncle Ernie Bell. Visitation will be held Wednesday April 17, 2019 5-8PM at Braman Mortuary Southwest Chapel. Funeral Service will be held Thursday April 18, 2019, at 12:30PM at Braman Mortuary (Southwest Chapel). Burial will take place at Omaha National Cemetery. Flowers are encouraged as Beverly loved flowers however if you choose, memorials be directed to Lani Anders Foundation. To send flowers or a remembrance gift to the family of Beverly Jean Newton-Pease, please visit our Tribute Store. "Email Address" would like to share the life celebration of Beverly Jean Newton-Pease. Click on the "link" to go to share a favorite memory or leave a condolence message for the family.